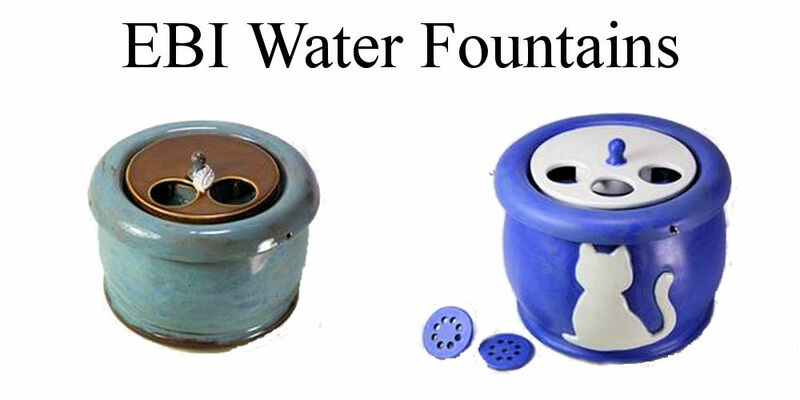 Recently, I made an investment in two Ebi Water Fountains for our Persian cats and kittens. I made this purchase because I have two cats that absolutely refuse to use a water bottle no matter how hard I try to "train" them to use it. While this is not an issue for one of our cats to use one of Charlie's Critters' bee hive bowls instead of a water bottle, for one of our Persian cats, Funfetti, this was not an option. Due to Funfetti's confinement to an enclosure in our room for the birthing and early raising of her kittens, I put a regular water bowl into her enclosure for her use. 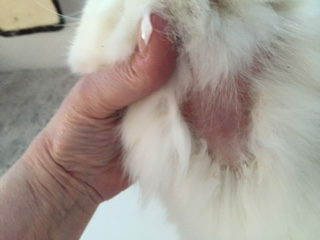 However, after a few weeks of using a water bowl she soon developed a skin infection because of the constant dampness of her fur (picture on right). Hence, my research into a water fountain that would work well with a Persian cat, their long hair, and for our cats that liked to "play" in the water. While our Ebi Water Fountains were being made, the owner sent me a picture of our bowls before glazing and final firing (picture above). On one of the fountains is a design of a sitting cat (an additional fee is charged for a design). Both fountains have an insert to the "trough" of the fountain so that our Persian cats when drinking water cannot "ruff dunk", or get their fur wet because of reaching across a bowl while drinking. The larger fountain has three drinking holes, and the smaller fountain has two drinking holes. 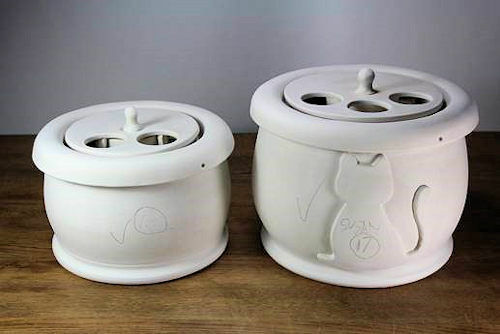 The water constantly circulates and they were easy to set up for immediate use by our cats. Pictured below are our two finished water fountains. It has now been about a month since we took delivery of the water fountains and the cats drinking from them. After installing the pump, adding water to the bowl, and installing the "Persian" insert in the drinking portion of the fountain, I placed one fountain (the small-sized one) in the caged in area for Funfetti and her four kittens. I assembled the medium-sized water fountain and set that one up in our kitchen for the use of the other cats in our household. Funfetti, our bottle hating, ruff-dunking Persian cat took to the fountain immediately! This was such a relief. The cats and our kittens love the fountains. A few of our cats still use the free-standing water bottles that I have in our home, but they also use the new water fountain. The water fountain pump is extremely quiet, hardly noticeable. The only time you hear the pump is if the water level gets too low and then all you do is add more water to the fountain bowl. Our Persian cat water fountain as demonstrated by creator, Ebi. We highly recommend these water fountains for those of you whose cats refuse to use a water bottle and make a mess of themselves when using traditional water bowls. Additionally, we would really hate if one of you had to go through what we did with Funfetti and her skin infection. When ordering, let them know Pelaqita Persians referred you and they will offer you free shipping on a regularly priced water fountain.